Check out what this college ministry is up to in Indiana. 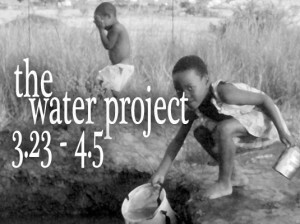 So, we have an opportunity to do something about this by joining with those who do not have access to clean water and bringing attention to their plight by drinking only water for 2 weeks starting March 23rd. We will join with college-age young adults all over Southern Indiana and drink nothing but water!! Hopefully, this experiment will connect us to an understanding of how rich and blessed we are. Also, hopefully this will bring each of us out of ignorance about this “sanctity of life” issue and compel us to act. And thanks guys…we can’t wait to share in this story with you!